Lisa Marie Fernandez's 'Yasmin' bikini is patterned with graphic white polka-dots to further enhance its retro feel. Made from soft cotton-blend terry, it has a wrap-effect top - ideal for those with smaller busts - and low-rise briefs with slim sides to minimize tan lines. 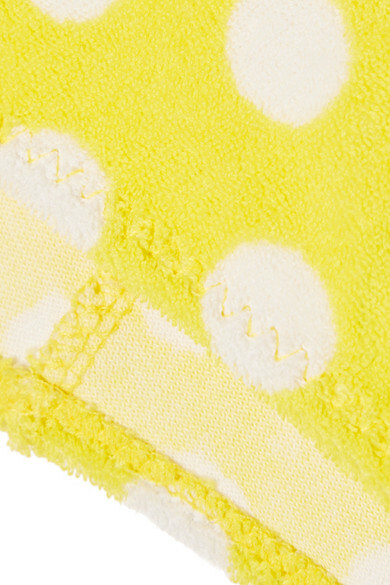 The bright-yellow hue will complement sun-kissed skin. Wear it with: Illesteva Sunglasses, Magda Butrym Necklace. - Lotion, sunscreen, oil and chlorine can cause discoloration of this item; this is not a manufacturing defect. Please follow care instructions to keep your swimwear in the best condition.